We resort to all kinds of stereotypes when we describe these millennial creatures that seem to be overrunning our workplaces. So, instead of attaching a loose, judgmental adjective to the current generation, a character comparison seems more fun. In honor of the seventh installment of Star Wars coming out at the end of this year, here are a few reasons why the millennial generation is the Han Solo of the workforce. When we are first introduced to Han Solo at the Mos Eisley Cantina, we learn he is in debt to crime boss Jabba the Hutt for an intergalactic drug smuggling run gone wrong. Recent grads have the same problem: they find themselves shackled to a Jabba the Hutt upon graduation — in their case, student loans. New graduates face higher debt ratios than ever before. Americans collectively owe over $1 trillion in student loans; only eight years ago, they owed a (comparatively measly) $461 billion. In a snail-paced recovering job market — 10 percent of Americans between the ages of 18 and 24 are nearly 10 percent less likely to have a job now than they were a decade ago – seeing red can leave the majority of millennials between Jabba and a hard place. Space cowboy Solo maneuvers his way through his money problems; just the same, Gen. Y-ers find ways to manage their student loans, using their entrepreneurial spirits, freelancing careers, and Web-based endeavors to stay afloat. More than one in three workers — 53 million Americans — are now freelancing, according to “Freelancing in America: A National Survey of the New Workforce,” commissioned by the Freelancers Union and Elance-oDesk. It is projected that by 2020, 40 percent of american workers will be freelancers. Captain Solo is super proud of his clunker, the Millennium Falcon. Keeping the (proverbial) ship together through ingenuity and adaptation is exactly what millennials do, too. Quick fixes, unconventional thinking, and a bit of “MacGyver-ing” is just what kept the Falcon afloat — and that’s what keeps millennials reinventing the world around us. Millennials know how to create, use, adapt, and own technology. New apps and systems are born every day, forcing young professionals to continually and perpetually adapt at a constant rate of change. 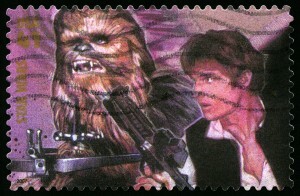 Princess Leia was quick to dismiss the brash Han as “stuck up and half-witted” at first. Just the same, millennials are often misjudged and misunderstood, called “lazy, narcissistic, and entitled” by many. Although he doesn’t fit the traditional personality type of a knight in shining armor, Han stepped up when he was needed. Our reluctant hero earned the Medal of Bravery; he adapted, learned, and fought for the Rebel Alliance. Like Solo, Gen. Y-ers will compete when called upon, too. Whether you believe they will destroy American culture or revitalize it, millennials are here to stay. Broke, underemployed, and misunderstood, millennials develop thick skins in the working world. With their tech-savvy and renegade thinking, Gen. Y-ers are equipped to take on their own “Death Star” — our recovering, yet tumultuous, economy. Millennials may not earn their own “Medals of Bravery” after putting in their 40-hour workweeks, but hey: free lunch and unlimited PTO while helping to create the next tech STRTUP sounds pretty good to me.